Discussion in 'Extreme and Water Cooling' started by Saate, Jan 29, 2014. So nickel or chrome on a 12.7mm copper pipe wont work? Nickel plating is in the micrometer category, I remember speaking to a electroplater about it when I had my AquaComputer blocks done. So that shouldn't be a problem. I'm not to sure about Chrome though. Cool I will be ordering when I get paid at the end of the month. I was actually thinking of powder coating which does add 0.5mm thickness. Chrome should not add 0.5mm, that's a lot even for hard chrome plating. Should he less than 0.02mm thick. Also yes powder coat will be thicker, but you can mask the ends for coating or plating. For the look it could be worth checking out stainless steel pipe, it can be 'electropolished' which is an acid process that leaves a chrome like finish. you're a genius. but sadly im going away for some time. will definitely buy some when i get back. its going to be an ongoing thing right? not just a one time run? Saate will these work with (12.7) acrylic tube as well?? Powder coating copper tubes would be interesting, although I'd probably look at different kinds of plating options or tubing first. One solution for powdercoating though would be to bend the pipes to the correct lengths first and mark the points they're going into the fittings. That way you can tape off those parts and only coat the visible bits. Just have to be careful about galvanic corrosion if you're going to use it in loops, I think steel and copper/brass don't make the best of mates. To the big house? :O Yeah now that the word is getting out I can't see why they wouldnt be an ongoing thing, with more and more stuff added as we (eg the community) see fit. At the moment I'm down to 16 x 4-packs and 13 x 12-packs so shouldnt be a problem. My hat goes off to you Saate. You took an idea and made it a reality. I really wish you all the success with your new business. Pps. Still like the loom of nickel tubing over copper. Thanks mate Yeah I'm looking forward to playing with the nickel plating look in upcoming builds. Absolutely, what've you got in mind? Knurling seems to be the standard for fittings and when I considered alternatives for these ones variations like horizontal/vertical lines felt like they'd have too much clash potential with builds. Really appreciating the support, encouragement and energy you guys are putting in! I'm extremely impressed Saate. That's amazing work you've done there. Are other finishes available yet besides the bright Nickel? I would really like a dozen black. I was thinking for along the lines of no texture at all, just a set square slits on top enabling the user to tighten it in with something like a coin. So as to get that ultra clean look from the fitting to the pipe. If the fittings and pipe where then plated in the same colour it would look almost like the pipe and fitting are one unit. Black will eventually be available, but not until the next production run most likely. Had some issues with the quality of the nickel plating on the ones we did so have had to hold off. I think I know what you mean and it's a cool idea. Thinking about it we could probably do something really clever and put the tightening grip/mechanism inside the fitting. 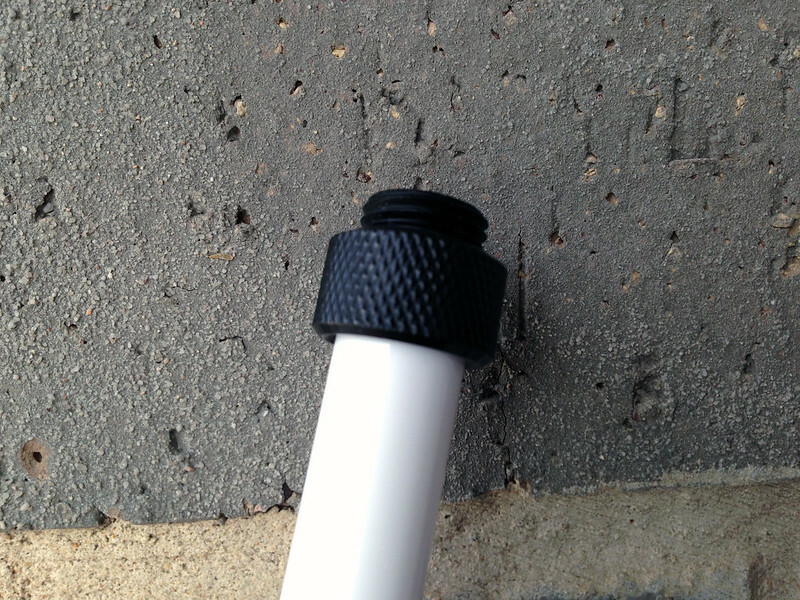 That way you could screw the fitting in then push the pipe inside for an ultra stealth/neat look. Hmmm! OMG that would be even better! I am all for the stealthiness. I like things so that when you put it together and other people look at it they go, huh how did you do that? Question though.. rigid tubing can be a pain in the arse within the work areas of a build. Do you currently, or do you plan to, have interconnect ability between soft tubing and copper? I'd love to be able to do a major amount of hidden plumbing with copper, and simply have some compact bulkhead connectors onto which I could then connect soft tubing for those places within the build where it might be desirable to be able to push aside a tube a little for better access without actually needing to dismantle the whole loop to do so. One of the reasons I haven't played with rigid acrylic too.